“Bibi” Netanyahu will most probably head the next Israeli government. 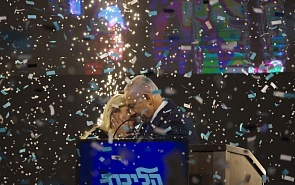 In an election that some expected to end with the public passing judgment on Netanyahu, the centre-left bloc parties were ultimately unable to obtain the 61 seats they would have needed in the next Knesset to prevent him from forming a coalition. The negotiations, however, that he will have to conduct with his potential partners will be tough. These partners have lost seats to Netanyahu's party, the Likud, giving it the most seats it has had since Netanyahu took the helm. This is despite the legal Sword of Damocles hanging above his head for alleged personal criminal offenses. Even though they have fewer seats, Netanyahu needs the smaller parties on the right, and they will personally demand key ministries and the adoption of certain policies in the next government. The policies concerning security and relations with the Palestinians which some of these partners will demand will, if accepted By Netanyahu, cause serious problems in the regional and international arenas. They include the application of Israeli law within major Jewish settlements in the West Bank and chunks of Area C, or their outright annexation by Israel; Area C presently constitutes 60 percent of the territory of the West Bank. Netanyahu himself noted this possibility as part of his efforts to siphon votes away from the smaller right wing parties. Now he will face demands to parlay these campaign ideas into government policy. The mere discussion of the steps this will necessitate, such as preparing a draft of the legislation for the Knesset’s approval, is expected to trigger sharp reactions in the Middle East and elsewhere. The Palestinians, who are already engaged in diplomatic warfare against Israel, will no doubt redouble their efforts to take the issue to the UN Security Council and other international bodies. If indeed, the next Israeli government includes in its programme a reference to the annexation of Area C, other players, both regional and international, will be compelled to respond. Jordan’s King Abdullah and President Sisi of Egypt will be under domestic pressure to freeze diplomatic relations with Israel. Hopes for developing relations between Israel, Saudi Arabia and other Gulf states will be nipped in the bud. The US reaction to a possible Israeli annexation initiative is of special interest. Some may say that President Trump’s recognition of Israel’s sovereignty over the Golan Heights was interpreted by the right-wing parties as a go-ahead signal for the annexation of major Jewish settlements. Already in 2004, then-US President George W. Bush alluded to the possibility that these blocs will remain under Israel’s control as an outcome of the final status arrangement between Israel and the Palestinians. The personal chemistry between President Putin and Israel’s PM and what was seen by many in Israel as Putin’s endorsement for Netanyahu in the election campaign will hardly stop Russia from sharply criticizing Israel if indeed it moves towards annexation. Such a reaction is also to be expected from the EU and China. Washington’s unilateral, egotistical steps, which resulted in increased confrontation and a decline in overall security, could encourage regional players to take advantage of the situation “on the ground”, ignoring international decisions, which are ignored anyway. Under these conditions, the demand is increased for Russia's role as a responsible player. A related issue is the reaction of the next Israeli government to a possible deterioration in the already tenuous situation in Gaza. The outgoing government resisted Israeli public opinion, which pressured it to react in a much harsher way to the launching of rockets from Gaza towards Israeli urban centres in the heart of the country. Netanyahu may feel less constrained once he forms a new government and if rocket strikes or other terror activities associated with Gaza are resumed. A large-scale Israeli reaction will certainly put the international community in a dilemma regarding how to react, on the one hand, to Israel exerting its right to defend itself, and on the other hand, the whole question of proportionality. Targeting the deal concerning Iran’s nuclear activity, the 2015 JCPOA, was one of the focal points of Netanyahu’s international agenda. It is likely to remain so, although the issue did not come up in the election campaign. The various future scenarios of an Israeli government headed by Netanyahu depend to a large extent on the legal and juridical aspects of the offenses he is accused of. These may unfold during the next months and may influence the longevity of the next Israeli government.